Being brought up in a family with strong Christian faith, I was taught from an early age by my late father, Dr. Chan Shun, the importance of helping people and giving back to the community. I believe the practice of helping others should be an integral part of one’s life and I am committed to continue our family’s involvement in philanthropy. It is with this fundamental belief in mind that Friends of Asia Hong Kong is built upon. Asia, and specifically Hong Kong, has enjoyed many financial successes over the years and has grown to become a dominant force on a global level. However, other things such as physical activity and the focus on health and wellness may have been sacrificed at the expense of economic prosperity. This is especially the case in the less privileged community where they often lack the knowledge and resources to look after their physical and mental well-being. Through Friends of Asia Hong Kong, we hope to acknowledge this issue by providing the needy and underprivileged with the right programs and resources to help them live a healthy lifestyle. In turn, they can gain important values like confidence, perseverance, positivity and teamwork – all the qualities pertinent to help transform our society. In our society there are a lot of children who cannot take steps towards fulfilling their dreams in sports due to financial constraints; there are people with disabilities who cannot be active because of a lack of equipment or training; there are seniors without access to recreational facilities or simply people whose lives can be vastly improved if provided with the opportunities to leading a healthy lifestyle. Friends of Asia Hong Kong is committed to help address those needs and create those opportunities. Friends of Asia Hong Kong aims to raise funds through sports and health-related events and distribute those resources to support three main pillars: physical health, mental health and preventative medical education for the less fortunate in our community. In line with our beliefs, we have been involved with organisations that care for autistic children, sports organization for underprivileged youths, hospital play for ill children and breast cancer research institutions. In the long run, we hope to work with more partners from varying sectors to grow our sports and health programs and strive to deliver sustainable benefits to a wider community. 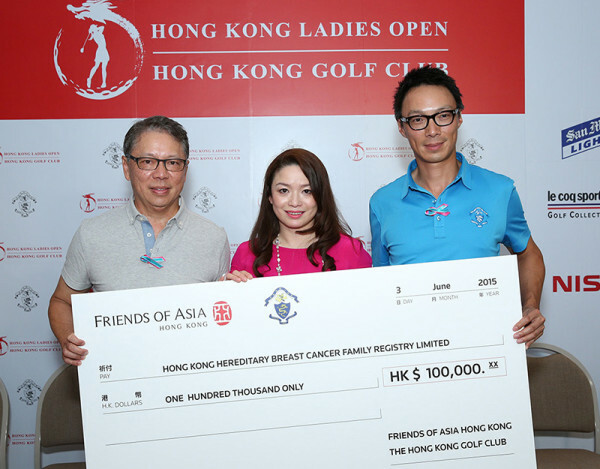 Left to right: Dr. Caleb Chan (Founder & Chairman of Friends of Asia HK), Dr. Ava Kwong (Chairlady of The Hong Kong Hereditary Breast Cancer Family Registry), and Mr. Arnold Wong (Vice Captain of Hong Kong Golf Club).